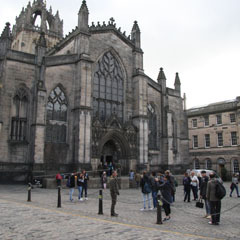 The story of Thomas Aikenhead shows how much Scotland had changed in the 50 years between the end of the 17th century and the period of the Scottish Enlightenment. 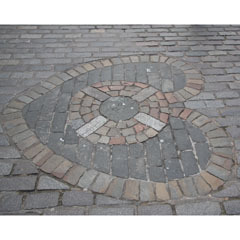 It was in the Tolbooth that stood near the spot where a heart-shaped mosaic, the Heart of Midlothian, is now to be found that Aikenhead, a 20-year-old student at the University of Edinburgh, was held before being executed for basphemy in 1697. His crime was to mock the scriptures and call Jesus ‘an imposter’. Aitkenhead was the last person executed for blasphemy in Britain. If the philosopher David Hume had lived a few decades earlier his religious scepticism might perhaps have had more serious consequences for him. 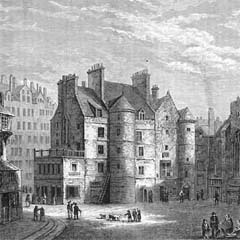 An engraving of the old Edinburgh Tolbooth based on an eighteenth century painting by Alexander Naysmith.